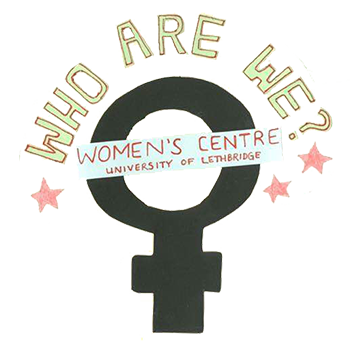 The Campus Women's Centre is a resource and referral centre for women identifying & gender non conforming people. We are here to advocate for you, create change, and support you. We believe that women must be offered environments in which their experiences can be recognized and validated. We acknowledge that racism, sexism, classism, heterosexism, ableism, ageism, and religious discrimination are deeply embedded in society and we strive to provide an atmosphere free from these prejudices. We are dedicated to advocating for positive change by empowering and celebrating women. We believe that by addressing issues of discrimination and working towards the creation of an environment based upon equality, the Campus Women's Centre (CWC) is creating a better environment for students, staff, faculty. Through educational events, volunteerism, activism, group discussions, and individual consulting, the CWC strives to improve the quality of life for everyone and the University of Lethbridge. We believe that women must be offered environments in which their experiences can be recognized and validated. Men are equally welcome and encouraged to use our resources, offer support, and participate in our event programs. We aim to create an open, caring, and nonjudgmental environment enabling clients to share their problems openly. We acknowledge that racism, sexism, classism, heterosexism, ableism, ageism, and religious discrimination are deeply embedded in society and we strive to provide an atmosphere free from these prejudices. We believe that information can alleviate misconceptions and add to empowerment; therefore we believe in the importance of educating our campus community about discrimination and ways that women can get the support and resources that they need.